This novel takes place in a dystopian world in which the entire community lives within a silo and never steps foot outside. But from the start, some characters are drawn to finding out what is out there. Book clubs can talk about the world Howey creates, the way humans adapt to it and the choices characters make when faced with different situations. An astronaut, assumed dead, is left alone on Mars and faced with finding a way to survive until help can arrive. Written as a journal, the novel gets deep into the character of the astronaut, Mark. Book clubs can talk about the way he approaches the challenges he faces and the coping mechanisms he uses to get by. The writing style, including the scientific details that Weir uses throughout, can also be discussed. Here's a post-apocalyptic novel with a unique spin. You won't find zombies in this one; instead you'll find musicians and actors who are trying to make their way through this new world by sharing their traditional talents. Book clubs can talk about the way different characters adapt to the new world and also discuss their actions and decisions before the flu epidemic changed everything. This is a classic novel, which may appeal to some who have never read it or who haven't picked it up in many years. Book clubs can talk about the future Bradbury creates and the similarities and differences between it and the real future. Themes of censorship, popular culture, human conviction, and much more will also provide book clubs with plenty to discuss. This is the one book on the list that I actually read with my book club and it was a great discussion. This novel is about a man who relives his life over and over again, each time being reborn a little older, but always dying at the age of 43. Book clubs can talk about all the ways he chooses to live his life, and what they might choose to do in this situation. 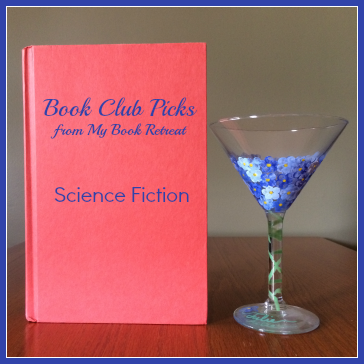 What are your favorite science fiction books? Do you have any that you'd recommend for book clubs to discuss? Oh, wow!! You included Replay on your list - my all-time favorite book! I can't believe your book group read it - most people have never heard of it. Like you, I think it provides great opportunities for discussion of why he made the choices he did and What Would You Do? And I LOVED Wool (need to read the rest of the series) and of course, Fahrenheit 451. The Martian is next up for me, as soon as I finish my current book (missed the discussion last night), and you know I want to read Station Eleven, too! Yes! One of the women in my book group loved Replay too so she hosted it a couple years ago. I remember you loved it too! Great book and perfect for book club discussion.